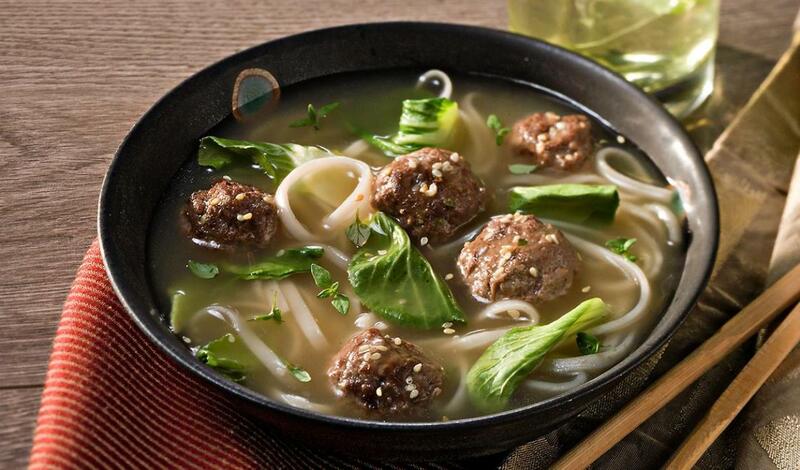 Japanese Udon noodles soak up notes of ginger and garlic in this Asian-inspired soup. Mix all ingredients in a large bowl until well incorporated. Using a #40 scoop, make meatballs (should form 75 - 1" round balls). Refrigerate. Sauté onion in peanut oil until soft, add garlic and ginger. Add Knorr® Professional Liquid Concentrated Chicken Flavor Base and bring to a boil, then reduce to a simmer. Add meatballs and cook until done, about 8 minutes (skim surface during cooking). Make a slurry with cornstarch and add to the soup. Add noodles andbok choy, and cook about 2 minutes. Top with sesame oil and serve.